Florida Gulf Coast University and Penn State once again lead the way in the Southeast as the ACHA Men’s Division 2 released its’ third ranking. Both team have held the spots in the previous two rankings. The race for #3 tightened up with week as four teams, NC State, Cincinnati, Liberty, and Delaware all ended up with the same ranking. The MACH continues to lead in league representation with six teams in the Top 20. UMass-Amherst maintained the top spot in the region this past week despite losing a close game with the new #2 Boston College. RPI jumped from #8 last week to #3 this week with wins over Montclair State and #4 Northeastern. #5 Norwich remains in the top 5 followed closely by Holy Cross and the team that made a big move this week #7 Keene State. New teams in the top twenty are #18 Providence College, #20 Bridgewater State and #14 UMass Lowell. Next Ranking will be released on December 6, 2018. 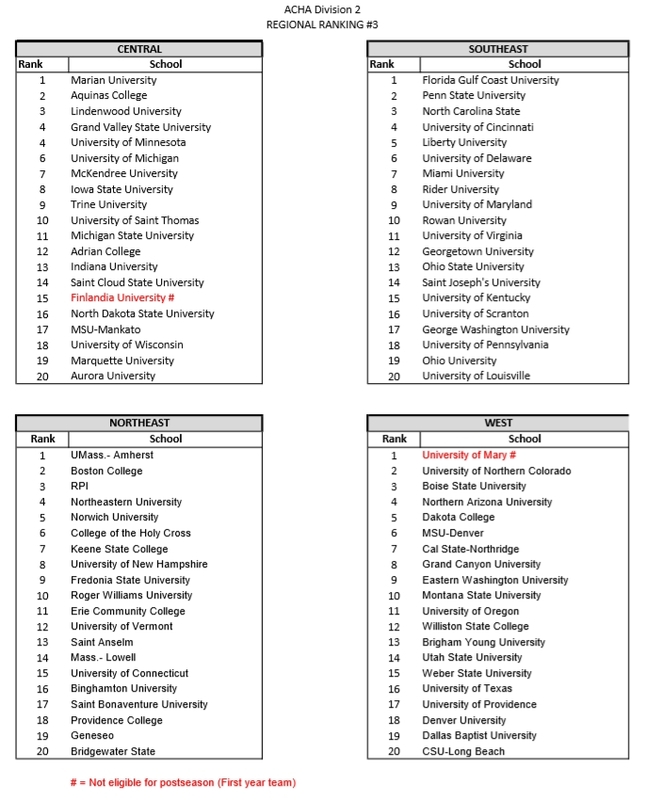 These rankings will be used to determine the field of teams for the ACHA postseason tournaments. The top two teams from each region will secure an automatic bid to the 2019 ACHA Men’s D2 National Championships. The third ranked team through tenth ranked team in each region will then participate in a Regional. Two additional teams are included in the Regional, either with a League Autobid or Wild Card teams. Two teams from each region will secure bids to the Nationals through these Regional Tournaments, completing the 16 team field. Final Ranking will be released on February 13, 2019.